We realise moving home and all your worldly possessions can be a very stressful and traumatic time. So our aim is to make your moving experience as pleasant as possible. Whether you require an internal move or a complete relocation of your company, locally or nationally, Funnells can fulfil all your removal needs effectively and efficiently. Funnells offer containerised storage and archive storage which includes a file retrieval and delivery service. All our facilities are well maintained, alarmed and very secure. 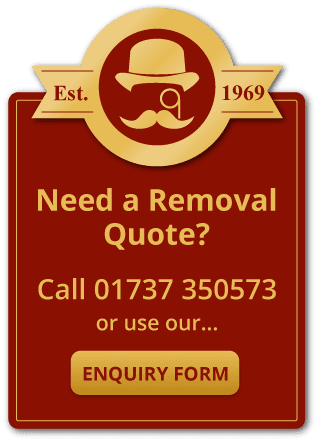 Funnells Removals are centrally based in Banstead to carry out home removals throughout South London and Surrey, including Croydon, Sutton, Wimbledon, Epsom, Kingston, Clapham, Wandsworth, Reigate and Redhill. We are home removal specialists with many years experience in the careful relocation of peoples personal belongings with our fully trained, uniformed and experienced staff. We are experienced and fully trained to move pianos of all types, grandfather clocks, barometers and antique furniture. Whatever you need moving we can handle it, so call us now for a free quotation. Come to Funnell’s Removals and take the worry out of the big day. We are a family run company with over 40 years of experience and have developed a clear philosophy about customer care and service. We combine our professionalism with a friendly, easy approach which is rarely found anywhere today. It doesn’t matter what you’ve got or where it’s going we can handle it with confidence and care. If your moving soon and want things to go well, simply call or email us and when you do move you’ll be glad you used Funnells Removals.